As I mentioned in the thread at the Bethesda forums, I'd like to offer my help with dialogue and quest design. 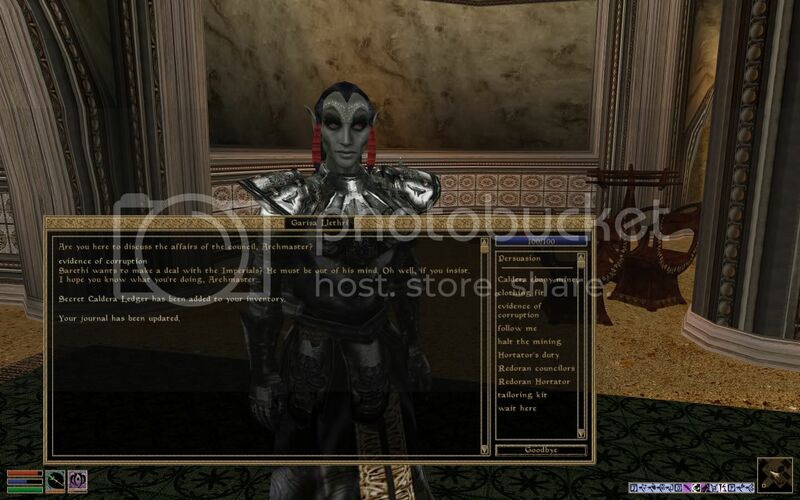 Unfortunately the only showcase I have is the House Redoran mod I've been working on, which contains 3 finished and 2 unfinished quests as well as some additional dialogue. 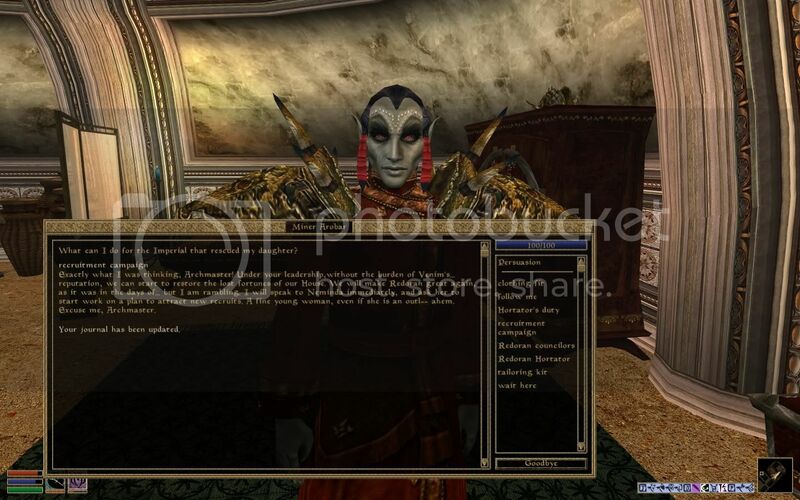 I'm wary of posting it here because a) I obviously don't want to make it public at present, and b) it depends on the player having completed the vanilla Redoran questline. If the latter isn't a problem, I'll send a link to the file through PM or similar. 10 Garisa Llethri wants me to prevent the Caldera mines from re-opening. 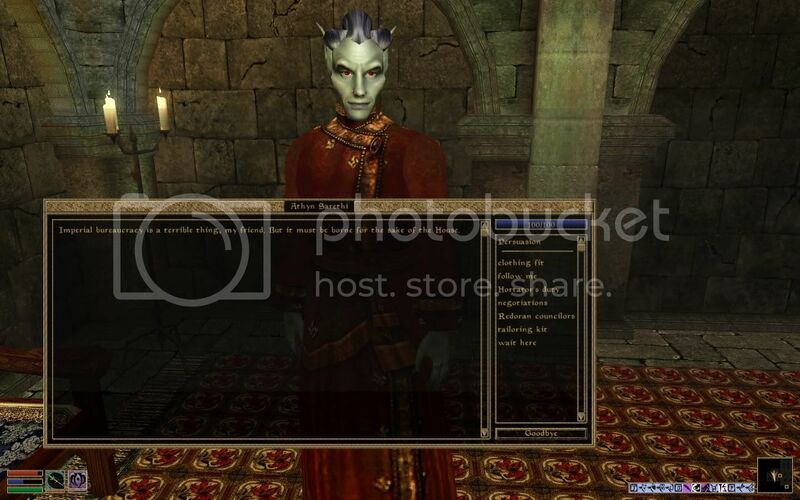 I should go to Balmora and intercept the new overseer who is traveling to Caldera. 11 Garisa Llethri wants me to prevent the Caldera mines from re-opening. 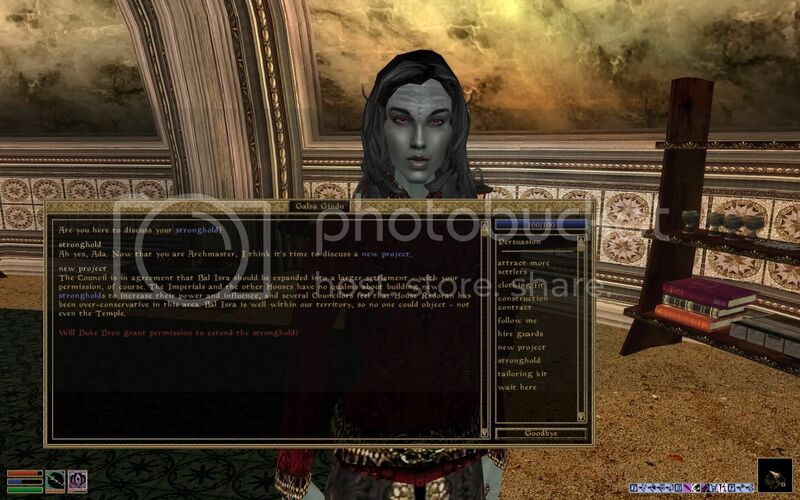 I should go to Balmora and intercept the merchant who is transporting slaves to Caldera. 20 I encountered Malven Orethi on the road to Caldera and persuaded him to turn back. 30 Llethri's next plan is to introduce 'tainted' ebony into the stocks at Caldera mine. I should look for 2 different crates - one inside the mine itself, one in the storerooms - and replace the genuine ebony with the pieces he gave me. 35 I put some of Garisa's tainted ebony into a storage crate at the Caldera mines. 36 I put some of Garisa's tainted ebony into a second crate at the mine. 40 Garisa Llethri was happy to hear that I had carried out his instructions. We must wait a couple of days to see if our plan is a success. 50 Garisa gave me a letter showing that Caldera Mining Company has abandoned the mines. Now House Redoran can move in and take them over. This all looks good to me. I'll see what the others think, but the dialogue seems clean and I don't doubt that the scripts work. Finally we're getting some use out of the spoiler tags I added early last month. While I am not an expert, I can see when writing flows nicely and this dialog seems to. Welcome aboard. You now have access to the rest of the forums. Feel free to read up on our plans and then write up all the quest designs you want. 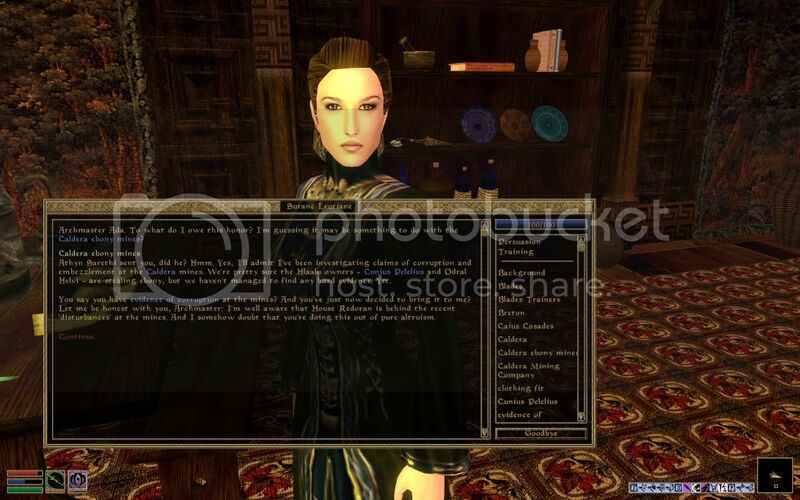 Mostly miscellaneous type quests for Stirk would be the most priority for our first release. Congratz! P:C has a quester now yay! Thanks! I'm at work right now, so I'll take a look at everything a bit later. Congratz. I wish you the best luck over here.